The University of Michigan is one of the oldest public universities in the nation, and today remains one of the highest ranked. The school holds the largest pre-med and pre-law programs. Astronauts, Pulitzer Prize winners, Supreme Court Justices, internationally acclaimed composers, and many more distinguished professionals, make up the highly distinguished teaching staff. The Wolverines have won more than fifty national championships in twelve different sports. Go Blue! The buildings depicted are Hill Auditorium, The Law Quad, and the Museum of Art. The Gothic style buildings that make up The Law Quad were intended to reflect the serious nature of teaching as well as a strong sense of community. The Museum of Art houses a collection that represents over 150 years at the University. 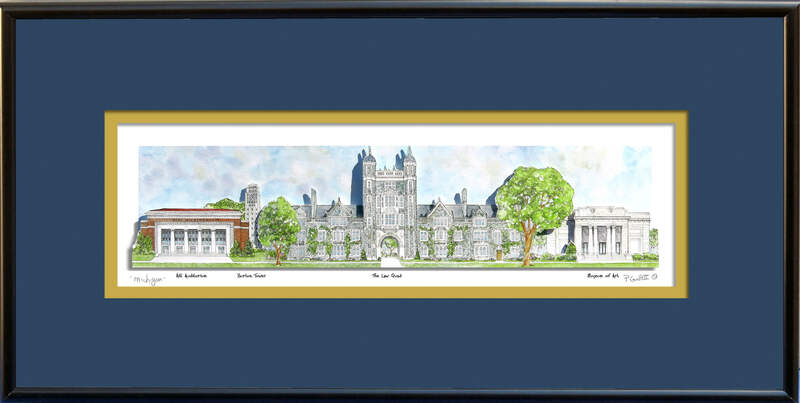 University of Michigan delights in its history, academics, and athletics making this a unique gift for recent graduates, past alumni, and fans of all ages. Relive the memories! 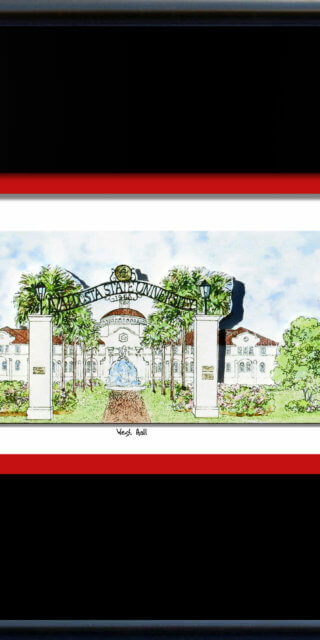 Your school’s artwork was created by hand using pen, ink, and watercolor. The paper is hand cut and layered to give the work a creative three-dimensional appeal. 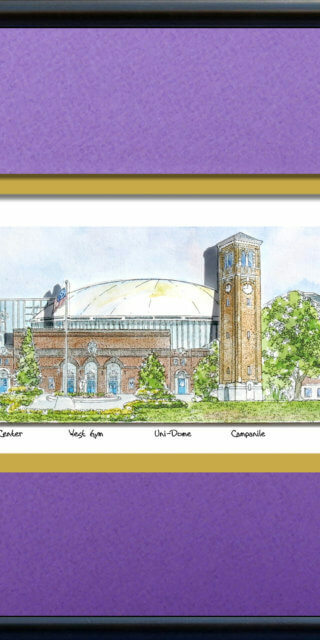 The image is 3.5” x 12.5” and is framed with a blue/maize mat in a 9” x 18” quality, black metal frame.